There are many great run schemes that you can build your offense around. I have chosen the Inside Zone because it’s easy to teach, it’s highly versatile, and it can create easy double teams on the line of scrimmage. 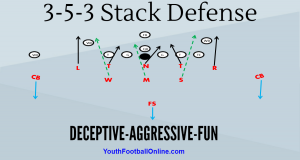 The Berlin Series is a great system of plays that can create confusion for the defense on an extra point attempt. The idea behind the Berlin Series is that by breaking into an unconventional formation and snapping the ball quickly. The simple process of thinking about goals has been shown to increase motivation. When the student athlete writes these goals down, the likelihood of achieving them doubles. Nothing stresses out defenses quite like giving a fast player the ball on the outside. This premise is exactly why the Jet Sweep is one of the most universal plays in football. The Outside Zone blocking scheme is one of the most universal schemes in football. Behind the Inside Zone it is the second most popular scheme at the professional and college level. “Practice does not make perfect, perfect practice makes perfect.” This age old quote highlights the importance of mindfulness in practice. One of the most important parts of any High School program is the development of the middle school and youth leagues.e The key difference between successful programs and programs that have good teams from year to year is the development of the feeder programs. Linebackers are the heart of the defense and must be able to make consistent tackles in a variety of different situations. Sometimes linebackers have to make tackles in a confined space. The heart of Goal Line Defense is an attitude that no matter the circumstances the offense will not cross the goal line. This attitude is a belief that must be developed and nurtured in a team. Game Day Warm Up Preparation for Youth Football Game Day can be an interesting time. There’s always a buzz in the air as the players prepare for the game and the coaches get excited for the upcoming test.